This great little book will provide you with a basic introduction to Emotional Freedom Techniques (or EFT) and have you tapping away within the hour. It also provides a handy reference as you develop the technique. EFT In Your Pocket has sold over 20,000 copies worldwide, is ranked high on Amazon for the subject of EFT and is also used and recommended by many therapists. 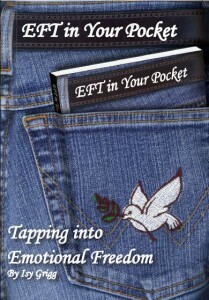 Now available, EFT in your Pocket 4th edition. To order, click on the image of the 4th Edition below and you will be directed to Amazon UK to complete your order. Please note; Previous editions are now out of print, but second hand copies are available on Amazon. To order, click on the image below and you will be directed to Amazon UK to complete your order.